Head coach of Nigeria’s Super Eagles, Stephen Keshi is upbeat despite his side’s loss to Egypt in an international friendly on Thursday. Goals from Ahmed Tesmah, Mohammed Aboutreka and Hassan Mekky rendered strikes by Uche Kalu and Sunday Mba academic as the Pharoahs nicked a heated contest 3-2 at the Al Maktoum Stadium in Dubai. 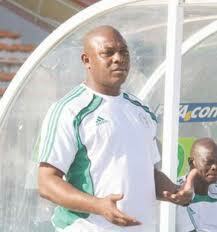 Keshi refused to be saddened by the defeat praising his boys ‘for doing a good job despite the odds’. According to him,the boys did well despite the odds and there is nothing to feel sad about and should be appreciated To have played well against such a top side in the Pharaohs of Egypt. The Nigeria team arrived in Abuja by 1pm, Friday and are expected to be given a one week break after which they will be expected to reconvene in Abuja.